“They told me to take a streetcar named Desire, and then transfer to one called Cemeteries…” Tennessee Williams’ troubled heroine Blanche Dubois thus used New Orleans’ cemeteries as a landmark to find her way through the city in “A Streetcar Named Desire,” as have many others, not only to mark a physical place, but also to mark a cultural note in time. 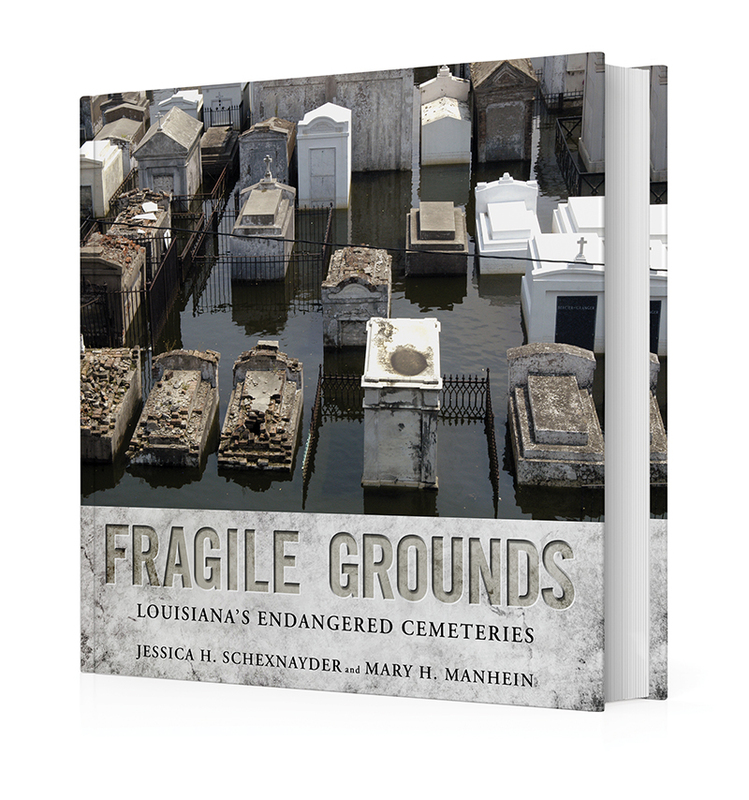 Throughout literature, music and history, New Orleans’ cemeteries, and those of southern and coastal regions of the state, Louisiana’s “Cities of the Dead” are, simply put, iconic.But with rising sea waters and the loss of land along the Gulf Coast, many of these remarkable low-lying burial grounds are being lost. Writer and photographer Shexnayder and Manhein, retired director of the Forensic Anthropology and Computer Enhancement Services at Louisiana State University, use their academic backgrounds and experience to give readers a history of the laws and land, an overview of burial customs found throughout the area, as well as and in-depth look at coastal cemeteries and those upstate. From mausoleums, caveau (vaults), society tombs and tabletop burials, Louisiana’s burial customs including, heritage form Native Americans, French, Spanish, African, German, Islenos and Vietnamese, are in danger from land loss and coastal erosion. While immigration away from flood plains is not new to people that inhabit areas prone to flooding and natural changing landscapes, the increase in the rate of land loss has made the mission to document and appreciate these precious areas even more important, according to Schexnayder. Manhein echoed Schexnayder’s thoughts, reflecting on her own experience living and working in the area and watching it swiftly wash away. University of Mississippi Press, 148 p., $30. In “Approaching the Fields” poet Chanda Feldman brings together the day-to-day toils of the distant past and the present-day in a lyrical tribute to southern workers, farmers and homemakers. Feldman, whose poems have appeared in numerous journals including The Southern Review, New South and Ecotone, explores themes of work, both physical and emotional, love, courage, darkness and light. Louisiana has a long tradition of poets and writers who have contributed to the modern U.S. literary landscape. In “Voices from Louisiana,” professor emeritus of English at the University of Louisiana at Lafayette Ann Brewster Dobie brings together a collection of “who’s who” of the state’s best and brightest writing minds, including James Lee Burke, Ernest Gaines, William Joyce Shirley Ann Grau and many more. Each profile provides insight into the author’s inspiration, struggles and writing habits. Readers get an intimate glimpse into the writers’ lives, as if sharing a cup of tea with a dear friend; sure to be an inspiration to aspiring writers and literary lovers of all genres. “Memere’s Country Creole Cookbook” is part history book and part cookbook, with a generous sprinkling of lagniappe to spice up the culinary mix. Culinary expert, and native resident, Nancy Tregre Wilson explores the unique recipes of Louisiana’s German Coast, the rural community settled by German and French immigrants. Family recipes, well-loved classic Creole dishes and early-20th-century food preparation tips and rituals, such as pig tails and boucherie, are all included. Over two hundred recipes, like red bean gumbo, galettes and butterbeans, explore the rich culinary history of a region that if often overlooked.